The Glasfloss Puracell VP-S (4V) and VPX-S (2V) all-plastic frame extended surface mini-pleat filters offer high efficiency particulate removal, extended service life and extremely low resistance to air flow. 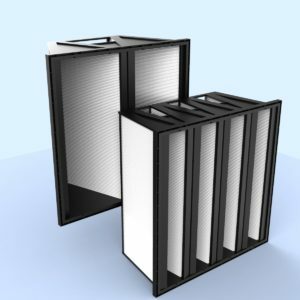 The Puracell VP-S and VPX-S plastic frame filters incorporate a lightweight, high-impact polystyrene framework for strength and durability in demanding commercial and industrial applications, and offer high efficiency and low resistance to airflow. When compared to traditional rigid cell and traditional box style filters, the Puracell VP-S and VPX-S minipleat series offer superior performance, lower operating costs and significant energy savings. The Puracell VP-S and VPX-S are available in MERV 11, 13 and 15 performances. The Puracell VP and VPX Series utilize multiple mini-pleat packs which allow low resistance to air flow and long service life. The media shall be water resistant, inorganic, wet laid glass microfiber which does not support the growth of bacteria or mold. The Puracell VP and VPX media packs are constructed by pleating a continuous sheet of media. The pleats are separated by a uniform glue bead that produces low pressure drop while maximizing the filtration area. The media packs are completely sealed and bonded within the heavyduty framework. The filters shall be rated to withstand temperatures up to 180 degrees Fahrenheit.